Although in this blog I usually time-travel to places and times I've never been, I've actually been to the Saguaro Apartments in 1979. In fact, I lived there from 1979 to 1980. And no, nothing spectacular happened there, it was just a place where people lived. If you're interested, I'd like to go back there with you now. My main goal when I grew up was to leave the snow and cold of Minneapolis. It really didn't matter to me where I went, I remember talking to my friends about Australia, or Mexico. The fact that I ended up in Phoenix just has to do with the minimum-wage job I had doing physical inventory while I was attending my first year of college in Minneapolis. I went to my boss one day, asked for a transfer, and he did it. He said, "Go to Phoenix, they're waiting for you!" It was an adventure that still makes me smile. If you grew up in Phoenix, there's no way that I can tell you how amazed I was at how hot the summers are. It's still the major drawback for many people who would like to live there, but just can't take the terrible heat. And it was especially bad for me at the Saguaro Apartments, because part of what made them "affordable" is that the little air conditioner in my room (yes, it was only one room) didn't work. Yes, it made noise, and rattled, but that's all it did. I had the manager replace it, but the "new" unit didn't work any better than the old one. It was an early lesson for me that when I could afford it, I would invest in excellent air conditioning. Also my car didn't have A/C, and I don't care what people claim, even in 1977, and even at age 19, it was miserable, and I hated it. I had moved from a city where the most important thing to have in your house and car was heat, and now I was learning that I would need to invest in air conditioning to deal with the heat in Phoenix. I could go on and on about the heat, but I believe for now I've said enough. That pic up there was taken by my mom, who visited once. My parents, and my Uncle Bob and Aunt Dorothy, would often visit Phoenix (usually Scottsdale) in the winter to play golf, and they would look in on me. And as horrible as my little place was, I was very proud to be there! My job doing physical inventory had faded away, from lack of hours, and I had decided to put my education to work. I was going to Phoenix College, and had just learned "Principles of Salesmanship", and I guess that I had learned that you should dress a certain way (I was all dressed up in that pic!) to do sales. My goal was to do freelance graphic design, and that meant doing stuff like driving to a client's place of business, taking notes, that sort of thing. 1977 was way before computer graphics, so I had a drawing board in my apartment. I also printed up business cards that said "Brad Hall Advertising Art" (I removed the "Advertising" from my company name in 1999), and my goal was to look as professional as possible - and not look as if I were some skinny kid in a ratty one-room apartment. Anyway, I was happy to be on my own, and I still am. To tried to keep cool, and I often spent a lot of time at the Phoenix Library, which was on Central and McDowell. And as ratty as the apartment complex was, it did have a nice little pool, which I spent a lot of time in, not really swimming just trying to keep cool. Yes, Phoenix is wonderful, but Phoenix is HOT! Thank you for visiting the Saguaro Apartments in 1979 with me! 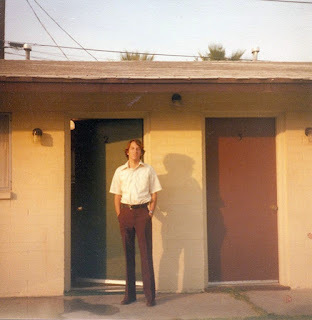 Image at the top of this post: Me in front of my apartment at the Saguaro Apartments in 1979, 4201 N. 9th Street, Phoenix, Arizona.